Welcome to our Jazz bass book page. Here you fill find jazz walking bass line books, excellent resources for learning to play jazz walking bass lines. Books on The Blues, Rhythm Changes, Standards, as well as books for learning and developing technique. Building a 12 key Facility for the Jazz Bassist is an excellent resource for those that want to dig a little deeper in to technical studies and constructing walking jazz bass lines. A complete guide demonstrating the devices used to construct walking jazz bass lines in the jazz tradition. Included is over 150 choruses of walking jazz bass lines over the Jazz Blues lines in 12 keys. Part 1. Demonstrates the techniques used by professional jazz bassists to construct walking jazz bass lines. Providing a strong harmonic and rhythmic foundation. Includes triads, 7th chords, voice leading, playing over the bar line, chord substitutions, pedal points, harmonic anticipation and chromatic approach notes. All exercises are designed to give the Bassist strong jazz walking bass lines in the bottom register of the instrument. As an added bonus for the Double Bassist Part 1 provides a complete study of the Blues in F whilst in the first and open positions. This is an excellent technique builder. Part 2. Outlines the techniques used in Part 1 providing the bassist with professional level walking bass lines in all 12 keys. Included is over 150 choruses of walking jazz bass lines over the Jazz Blues lines in 12 keys. Including many advanced principles of jazz bass line construction. Most importantly, never losing sight of the functioning principle of the bass in the jazz idiom. To provide a strong foundation of rhythm and harmony for the music being played , providing support for the melody and or soloist. Suitable for the beginning to advanced electric and double bassist. Book II in the Constructing Walking Jazz Bass Lines series, Rhythm Changes in 12 Keys provides various insights into how the Rhythm Changes song form may be approached by the Jazz Bassist. Rhythm Changes like the ” Blues ” is an essential part of the Jazz musicians walking bass line vocabulary. Book II in the Constructing Walking Jazz Bass Lines series, Rhythm Changes in 12 Keys provides various insights into how the Rhythm Changes song form may be approached by the Jazz Bassist. Outlines the Rhythm Changes form and provides examples of how to construct walking jazz bass lines using voice leading, chromatic passing tones, pedal points, tri-tone substitutions, and harmonic anticipation. Provides an in-depth look at the Rhythm Changes A sections and shows the common chord substitutions used by the bebop musicians when improvising. Provides an in-depth look at the Bridge or B section providing various chord substitutions used when improvising and walking bass lines. Outlines Rhythm Changes in 12 keys using all the previous lesson topics and bass line examples outlined in the book. Included are over 100 choruses of professional jazz bass lines in all 12 keys. Suitable for the beginning to advanced upright and electric bassist. All exercises are designed to give the Double Bassist and Electric Bassist strong jazz bass lines in the bottom register of the instrument. Part 2 expands on the lessons and techniques used in Part 1. Illustrating the aspiring Jazz Bassist with the previous devices used in professional level bass lines in all 12 keys. Providing over 70 choruses of Rhythm Changes in all 12 keys using the whole register of the instrument. Over 100 choruses of Rhythm Changes included in Part I and Part II of this book. Including many advanced principles applied to walking bass lines. Never losing sight of the functioning principle of the bass in the jazz idiom. Providing a strong foundation of rhythm and harmony for the music being played. Providing support for the melody and or soloist. Book III covers 24 jazz standard chord progressions. Building a 12 key Facility for the Jazz Bassist breaks down the jazz bass vocabulary by outlining key areas of harmonic structure related to the jazz standard and bebop styles. All lessons are applied to all 12 keys with written out bass lines and 333 MP3 backing tracks applied to 10 jazz and bebop standard chord progressions with over 150 choruses of written out bass line examples. As in the earlier books in the series the lesson material builds in a stepwise manner enabling the student to build on the solid foundational material discussed in books I – III. By practicing the material presented in this book, Book I of the series the bassist builds technical facility and expands on their jazz vocabulary by practicing the key harmonic structures used most often by jazz bassists in the jazz standard and bebop styles. Presented in this book and outlined with written out examples in all 12 keys are the fundamentals required by the professional jazz bassist. The II V I in major modulating to II V I in minor. Voice Leading The I VI II V over 2 and 4 measures. The I VI II V progression and the secondary dominant chord. The V of V cycle. The I IV III VI progression .The bVII Dominant 7th chord & the IV Minor bVII7 progression. The IV Minor bVII7 progression. The IV Major to IV Minor bVII7 progression. Turnarounds into the II IV & VI chords. Diatonic chord structures & the II V into the IV chord. Bridge Tritone substitution. Tritone substitution chord progressions. Accents, phrasing & anticipating the chord changes. The Minor key tonality & the Minor II V progression. The descending Minor II V I Bridge Tritone substitution of the Altered dominant chord. . Featuring major scale studies and modes, minor scale studies, diminished, wholetone and augmented scales. With written out examples of how to practice the scales, chords and modes in all 12 keys. Including over 5hrs of backing tracks 333 tracks in total. Building a 12 key Facility for the Jazz Bassist Pt. II – Methods for practicing scales, modes & arpeggios. Scales, modes and arpeggio studies are utilised by the bassist to learn harmony and instrumental facility while building dexterity, flexibilty and stamina. The 12 key exercise drills in this book are used as an aid to building muscle memory and training the ear. Building a 12 key Facility Pt. II Book V in the “Constructing Walking Jazz Bass Lines” series outlines the various approaches used to build instrumental facility through the study of scales, modes and arpeggios. Building a 12 key Facility Pt. 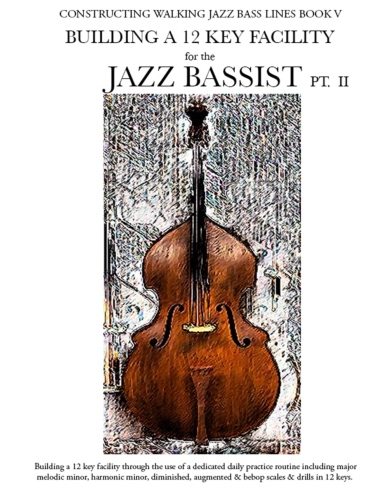 I Book IV in the “Constructing Walking Jazz Bass Lines ” series for the upright & electric bassist focuses on practicing jazz standard and bebop chord progressions in 12 keys. A task practised rigorously by the jazz masters. Included are the Major and Melodic minor scales, arpeggios and modes in 12 keys, Bebop scales, Blues scales, Major and Minor pentatonic scales and the Harmonic minor scale all in 12 keys. Also included are the symmetric scales : Whole tone, Diminished & Augmented scales in triad and 7th chord formations. Incorporating these techniques into the daily practice routine will solidify the core fundamentals required for the improvising musician. Scale studies are utilised by the bassist to learn harmony and instrumental facility building dexterity, flexibilty and stamina. The 12 key exercise drills for building muscle memory and training the ear. An excellent resource of information for bass players and music teachers of all levels. Practicing scales and having a dedicated daily practice routine are at the core of professional musicians worldwide.